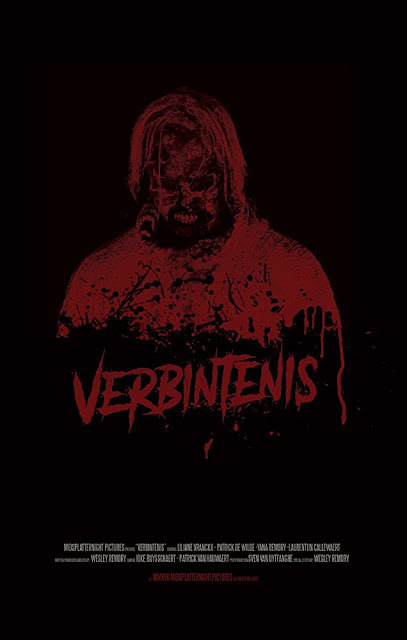 Verbintenis (that I believe translates as 'obligation') is a short Belgium horror film that was directed and written by amateur filmmaker Wesley Remory. This is a slow burn of a horror that even at just 10 minutes in length feels drawn out, yet this works in making the drama feel all the more realistic. Nearly the whole of Verbintenis plays out in silence with the couple solemnly preparing their son's dinner, yet by what they are doing and how they are acting you can tell they are heartbroken at what is occurring. Their son is locked up and appears to be some sort of zombie like creature, with some nice make-up effects that reminded me of one of the undead from classic 80's Italian zombie flick The Zombie Dead. You get sad music playing at the start and end that compliments the unhappy couple, for the majority though it is silent, so much so when the mother speaks towards the end it was jarring to have the spell broken. I thought both the man and woman did great jobs here, they show such emotion without even needing to say anything. The set design tells you a lot about what is going on, such as the couple looking at a photo of a boy, this not only lets the viewer know the importance of what is happening, but also serves as a reminder for them for why they have gone down the dark path they have. I thought the dank cellar was effective as the location chosen as the dreary setting helps with the overall mood. Aside from the usual comment that this may be a bit too slow going for some there isn't really much to complain about with Verbintenis. Sure not much may actually happen but this moody short is brought to life by the realistic acting of the two main leads that can't help but cause you to feel for the hell they have found themselves living with.